Glasbury United at the Corries ground with Trophy ? Initially the club membership was strong enough to support two teams and they played in both the Hereford and Welsh Leagues; usually deploying their first team in the Hereford league. This subterfuge was eventually discovered and they had to make a choice between the two. This was when they became affiliated solely to the Welsh Division. Tom Stather ran the team and organised dances for fund raising to buy their kit and pay for travel, to away matches. They occurred mainly in St Peters Hall and occasionally in the upstairs room of the Maesllwch Arms Hotel. The first pitch the team played on was at Roche Morgan's field, across the road from the Glasbury Scout Hut, left of the river below the bridge and in Radnorshire. They then moved over the bridge onto the grove and into Breconshire. Later still they had to move further on down the grove as the river gradually eroded its true right bank, making existing the pitch too narrow to be of practical use. 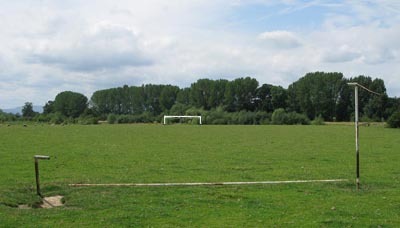 These goal-posts still survive at the present time ( August 2013 ), although one of them has been flattened by a recent flood. 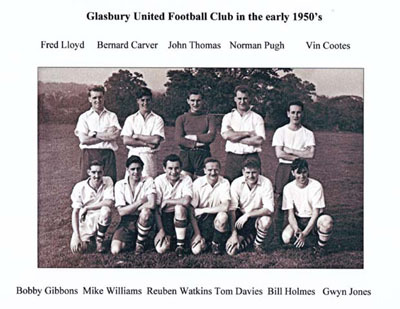 The Glasbury team played league football until the late 1960's, and after this time continued at a friendly level until the late 70's. 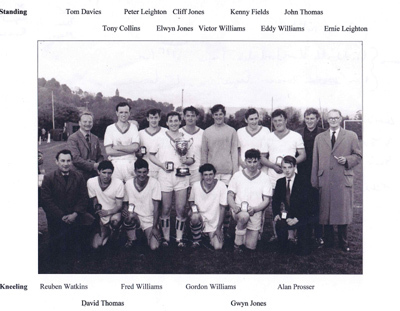 This final decade being a last hurrah for the Glasbury youngsters such as Mike Prosser, Martin Thomas, Philip Grifffiths, 'Snowy' Jones and friends.